Plunge into a colourful scuba diving holiday in the Fiji Islands by staying at a dive resort. Fiji is famous for its scuba diving sites – warm, clear waters with an abundance of tropical fish and colourful soft coral. Dive resorts are designed with the scuba diver in mind, bringing guests the best spots in the South Pacific. Here’s our guide to the best hotels for diving in Fiji. A variety of dive sites to suit different levels of experience, including the rich Namena Marine Reserve, are just a short boat journey away. Closed for 6 months after the deadly Cyclone Winston in February 2016, Jean-Michel Cousteau Diving now uses some of the cyclone-damaged areas as an educational tool for divers. Situated on the remote Kadavu Island, the Matana Beach Resort caters mainly to scuba divers. The resort has just 10 bures (Fijian style rooms) with accommodation for up to 24 guests at a time. Matana has its own power plant and uses solar energy for hot water. Dive sites are just a 5-15min boat journey away, so between trips, the team will return to shore where guests can enjoy a refreshment break. Due to its remote location, divers can expect clear waters with a variety of encounters including coral fish, mantas, turtles, tuna, sharks, sea snakes, nudibranchs and many more marine species. While diving is available year-round at this secluded spot in the Yasawas, the main reason scuba divers choose Mantaray Island Resort is, unsurprisingly, for its namesake – the manta rays. These impressive filter feeders are frequent visitors during the months of May to October, due to the nearby feeding channel which is rich in nutrients. In addition to SSI scuba diving certification, Mantaray Island Resort is Fiji’s only accredited Freediving operator, running two to three-day courses. Mantaray Island Fiji from Down Under Aquatic Imaging on Vimeo. Wananavu Beach Resort is the gateway to diving the colourful and thriving Bligh Water passage. The PADI 5-star dive resort is situated at the northeastern part of Viti Levu near Rakiraki, a couple of hours drive from Nadi. It’s an area of Fiji largely untouched by the majority of tourists, therefore maintaining a genuine Fijian vibe. Dive Wananavu specialises in larger diving groups and has over 40 dive sites in the passage. Dive Wananavu also offers Nitrox training. Taveuni is Fiji’s third island and considered to be the base for the best scuba diving in the Fiji Islands. Taveuni Dive Resort has been designed for divers, by divers. It has a strong sustainable focus while retaining the authenticity of the local Taveuni culture, using solar power and rooftop rain harvesting. It’s just a short walk to the marina where the dive boats are moored, ready to take guests out to the colourful and thriving Somosomo Strait. Not far from the diver’s paradise island of Taveuni, sits Qamea Resort and Spa. Its PADI 5-star dive centre runs trips to internationally renowned dive sites such as Purple Wall and Qamea Freeway, as well as charter dives to the famed White Wall and Rainbow Reef in the Somosomo Straits. The resort offers dive certification including a Nitrox speciality to make the most of every dive. Unlike many dive centres, Qamea’s operation offers flexible timing for those who prefer a later start than the traditional 8am check in. With such a small number of guests, there may be times you are the only diver on the boat, leading to a truly personal and intimate dive holiday. 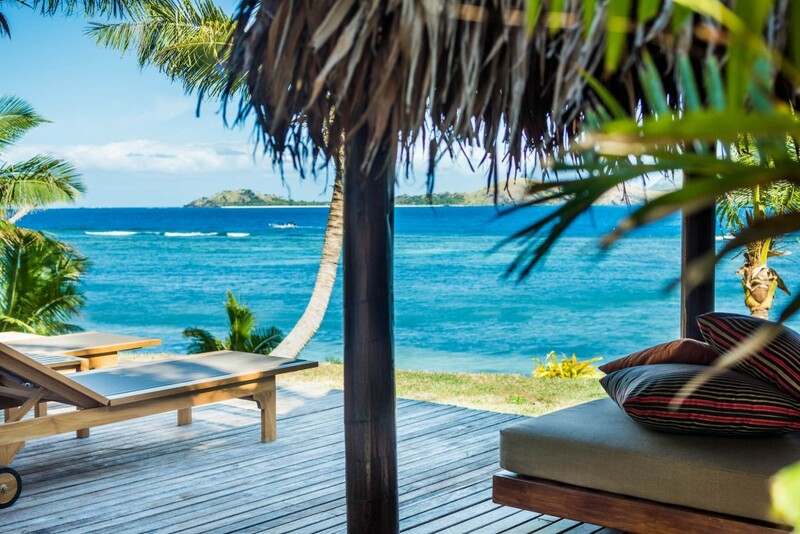 Namale Resort in Savusavu has a unique focus – a holistic, luxury scuba diving experience. The resort has hosted many celebrities over the year and prides itself on its luxurious setting and top service and facilities. Nearby dive sites include the thriving Namena Marine Reserve, Purple Gardens, the Rainbow Reef and the Somosomo Straits. With the sites only a short boat ride away, divers can head back to shore for their surface interval and enjoy the other watersports available, such as Stand-Up Paddleboarding or sea kayaking. If you’re looking for a diving retreat far away from hyperactive and noisy children, consider the adults-only boutique Tokoriki Island Resort, situated in the northern part of the Mamanuca Islands. Its PADI 5-star Gold Palm Dive Centre is an environmentally conscious operation with a strict, ‘no-touch’ policy on all marine life. The location of the resort is an ideal spot to explore a variety of dive sites with hundreds of fish species and soft and hard corals. Tokoriki can be accessed by a 15-minute helicopter flight or one-hour boat journey.